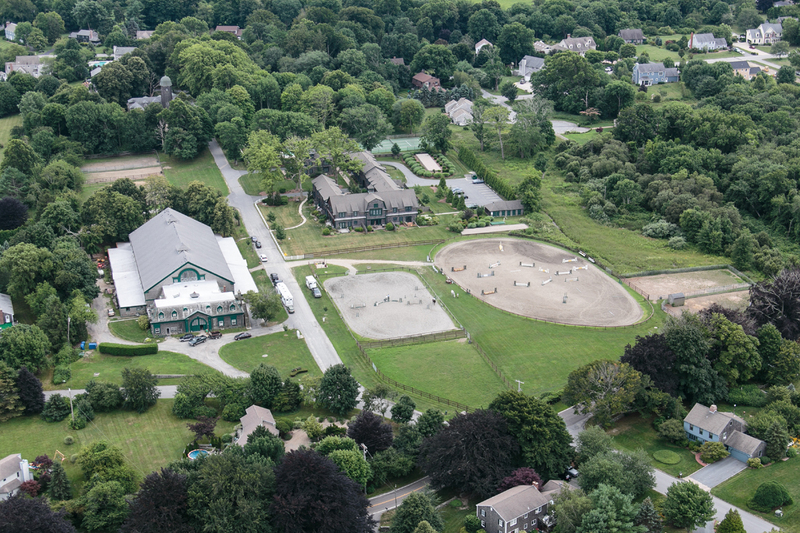 Sandy Point Stables is one of the last remaining parts of the original Vanderbilt Estate, a 280 acre complex that stretched from East Main Rd. (Rte. 138) to the water. 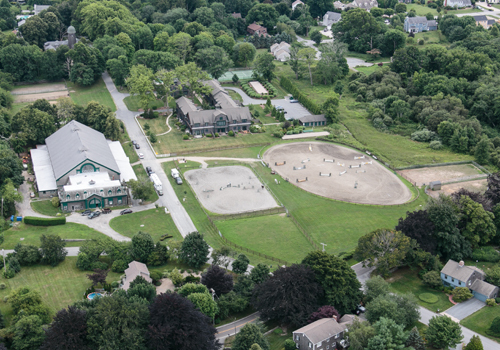 Constructed almost 100 years ago by Reggie Vanderbilt, the imposing structure contained 24 stalls, an indoor arena, grooms quarters and a lounge for Reggie and his guests. Reggie brought in the best materials and workers of the time for the construction. Main beams of 2x12 cypress support the 15,000 square foot riding arena. The roof peak complete with cupolas for ventilation is 60 above the floor of the arena. The arena, which is 150 long, was built with curved corners to accommodate carriages. The structure has 3 distinct roofs. The arena walls rise 20 above the stable roofing allowing windows along the entire length and both ends. Reggie was very involved in showing horses and was a Board of Directors member of the AHSA. He built the stable complex for his show horses and there have been show horses in the stable continuously since the stables completion in 1902. After leasing for many years, Jay Sargent bought the stable in 1994. Since then she has set about refurbishing the entire complex. The original grooms quarters which were at some point turned into apartments, have been redone. Some overlook the Sakonnet River, which was one of the original boundaries of the estate and all have had the original wood floors brought back to life. Reggies former lounge is now a well-known recording studio. The immense roofs have been replaced as have the sills and wood shingle siding. The building is a marvelous example of Newports "Golden Age" construction and is recognized as an important historical building.